On the afternoon of September 29, 1950, Lieutenant Thomas Finney was flying an F-86A Sabre (49-1090) in formation with three other Sabres as part of a training exercise when his jet suddenly lost power. This occurred while the formation was at 20,000 feet and over the Atlantic Ocean off Boston. Finney alerted the flight leader, Lieutenant Jack Schwab, that he had an emergency, and Schwab led him towards shore while giving instructions in the use of the ejection seat. Just before ejecting at 3,500 feet, Finney turned the jet towards open water. Finney landed in a tree near the town of Marblehead, and climbed down unhurt. After finding a telephone, he contacted the Coast Guard Air Base in Salem which sent a helicopter to retrieve him. The Sabre crashed on Phillips Beach in Swampscott scattering debris and live .50 caliber ammunition all along the sand. Nearly 5,000 curious onlookers descended on the area, but were held at bay by police. 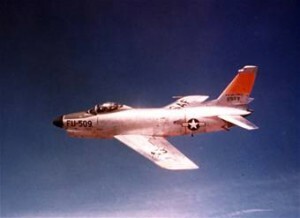 The flight of Sabres was attached to the 58th Fighter-Interceptor Squadron of the 33rd Fighter-Interceptor Group based at Otis Air Force Base. Falmouth Enterprise, “Pilot Parachutes To Safety As Jest Fighter Crashes” October 6, 1950.